Rousey’s getting love from all over the place. Undefeated Ultimate Fighting Championship (UFC) women’s bantamweight queen Ronda Rousey (12-0) is throwing her support behind fellow standout in the boxing world, WBA, IBO and WBC “interim” middleweight champion Gennady Golovkin (33-0), who faces David Lemieux (34-2) inside Madison Square Garden tonight (Sat. Oct. 17, 2015) in New York City. Golovkin is preparing for the 12th defense of his WBA and IBO titles and should he defeat the Canadian power-puncher Lemieux, the Kazakh will add the IBF 160-pound title to his collection. The 23-year-old’s run in the middleweight class is accentuated by stoppages over former champions Marco Antonio Rubio and Daniel Geale. 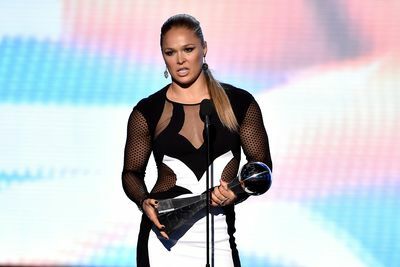 Similarly, “Rowdy” is on her way to completing her seventh title defense — former 18-time world champion boxer Holly Holm will have her say at the UFC 193 pay-per-view (PPV) on Nov. 15, 2015.